Hexa uses a puzzle set of twelve pieces, each comprising six equilateral triangles uniquely positioned. The puzzle uses only some of the pieces (5 or 9) from the full set depending of the chosen board. The pieces may be played with either face uppermost, and the different shapes are labeled from 1 to 12. You can experience Hexa online version here. The puzzle board has a special design and is made by a small green board for a low level of difficulty level (5 pieces) and an orange one for a higher level of difficulty (9 pieces). Other kinds of board are possible but the ideal boards are for 5 and 9 pieces. The unique design dictates that no solution has any piece plus position in common with another solution. For reference, each row of triangles is numbered and each triangle in a row is labelled with a letter. 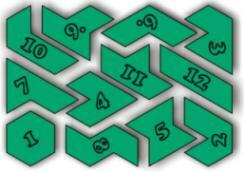 Thousands of problems are possible using only 5 pieces of the set for the green board or 9 pieces for the orange board. There may be problems involving both boards. The difficulty of a problem is governed by the board and the known position of one or more pieces. The purpose of the puzzle is to fill the board with the given pieces. Any problem consists of the set of selected pieces, the start position for one or more pieces, and the given board. Hexa has a booklet with problems and solutions. Submitted by salvador on Fri, 2006-02-24 10:02. Submitted by salvador on Thu, 2006-02-23 12:19. Submitted by Puzzle iT on Thu, 2006-02-23 13:51.